There are about 1,360 million cubic kilometers (326 million cubic miles) of water on Earth. Most of this water is stored in reservoirs such as the oceans, in glaciers and ice caps, underground, and in the atmosphere. In distinction to other planets in the solar system, sizeable amounts of water on the Earth can be found in solid, liquid, and vapor form. The largest amount of the water on Earth, about 97 percent, is stored in the oceans. The next largest amount of water, about 2 percent, is stored as ice in glaciers and polar ice sheets. A little more than half of the remaining one percent of water is stored underground as groundwater . The remaining less than one-half percent of the water on Earth is stored in lakes, rivers, and wetlands , and as vapor in the atmosphere. Despite the vast amount of water on Earth, most is too salty for human use. This includes all the water in the oceans and much of the water deep in the groundwater system. Most ice, although it is fresh water, is present in the more remote parts of the Earth and is not easily accessible to humans. Of water on Earth, only about one-third of one percent is fresh water that is usable by humans, and nearly all of that fresh water (97 percent) comes from groundwater. Water does not remain locked up in the oceans, icecaps, groundwater systems, or the atmosphere. Instead, water is continually moving from one reservoir to another. This movement of water is called the hydrologic cycle. A simplified illustration of the hydrologic cycle is shown in the figure. Although water in the hydrologic cycle is constantly in motion, it never leaves the Earth. The Earth is nearly a "closed system" like a terrarium. This means that the Earth neither gains nor loses much matter, including water. Although some matter, such as meteors from outer space, is captured by Earth, very little of Earth's matter escapes into outer space. This is certainly true of water. This means that the same water existing on Earth millions of years ago is still here today. Water that falls to Earth as precipitation follows many paths on its way back to the atmosphere. Precipitated water may be intercepted and taken up by plants; it may infiltrate the soil; or it may flow over the land surface or through the subsurface to reach streams, lakes, wetlands, and ultimately the ocean. Some of the discharged water is evaporated from surfaces and transpired by plants to reenter the atmosphere, and the hydrologic cycle continues. falls everywhere on Earth, but its distribution is highly variable. Largely owing to their greater surface area, the oceans receive three times more precipitation than the continents. Furthermore, on the continents it might not rain for years in parts of vast deserts, such as the Sahara in Africa. At the other extreme, precipitation might exceed 800 centimeters (315 inches) per year in tropical rain forests. Just as most precipitation falls on the oceans, most of the water that evaporates and returns to the atmosphere as water vapor is also from ocean surfaces. In fact, about 85 percent of the water that evaporates and returns to the atmosphere is from the oceans. The remaining 15 percent of water that moves to the atmosphere is from the continents. This includes evaporation from lakes, rivers, and soil and rock surfaces, and transpiration from plants. Evaporation from open water such as lakes and surface reservoirs does not vary much, but transpiration by plants can be very different; for example, the amount of water transpired by widely spaced desert plants is far less than the total amount of water transpired from dense forests. Precipitation that falls on the continents either runs over the surface of the Earth into streams, lakes, and wetlands, or soaks into the ground. Water that remains on the Earth's surface, such as streams, lakes, and wetlands, is called surface water. Water that soaks into the ground either is stored in the soil or recharges groundwater. Streams are the surface water that moves water from the continents back to the oceans as part of the hydrologic cycle. The surface water that is in lakes and wetlands is generally ponded, but this water also is active in the hydrologic cycle because lakes and wetlands evaporate water to the atmosphere, and they receive water from and lose water to the groundwater system. 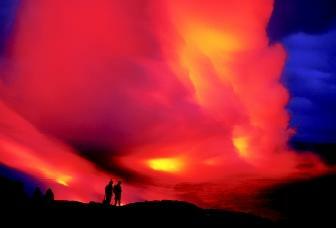 Clouds of steam reflect the red glow of lava as it flows from Hawaii's erupting Kilauea Crater into the Pacific Ocean. In this one instant, visitors witness water in various forms: vapor (steam), ocean (salt water), and perhaps ancient water molecules (originally from precipitation) in the magma (molten rock) derived from Earth's interior. In one portion of the hydrologic cycle, the water vapor is carried over the ocean and land, eventually returning to Earth as precipitation. and recharges the groundwater system. Many people think that groundwater is like an underground lake, but it is really the water that is found in the pore spaces between the grains of rock and sediment that make up the structure of the Earth. Unlike soil water, which does not move very far, groundwater moves in flow systems that can range in size from only a few meters in length to many hundreds of kilometers. These groundwater flow systems eventually discharge groundwater to surface-water bodies such as streams, lakes, and wet-lands. Groundwater also discharges directly to bays, estuaries , and oceans, but the amount is much less than the amount that discharges to streams, lakes, and wetlands. 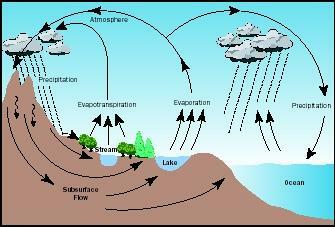 The hydrologic cycle is usually depicted on a global scale. However, the hydrologic cycle operates at many scales, from the hydrologic cycle of the Earth to the hydrologic cycle of a person's back yard. Generally, to use the small amount of the Earth's water that is suitable for humans (that is, only about one-third of one percent), people who manage water resources are most interested in the hydrologic cycle of watersheds. A watershed, which is sometimes called a drainage basin, is an area of land where all the water that falls on it will drain to a body of surface water, such as a stream or lake. An example of a drainage basin is a hillside that has a small creek at the bottom of it. All the rain that falls on the hillside will eventually flow downhill over the land surface or through the ground into the creek. In this simple example, the hillside is the creek's watershed. In reality, the watershed would be all the land area bordered by other such hillsides or elevated terrain. The watershed is like a large bowl that collects water and delivers it to the watershed outlet, which commonly is a stream or river. Because fresh surface water and fresh groundwater are the only parts of the hydrologic cycle that can be used by humans, most interest in the hydrologic cycle by water managers is focused on these resources. Although it is important to know how much water is stored in groundwater, lakes, and wetlands, understanding the movement of water to, within, and from watersheds is far more important, and a far greater challenge. Indeed, most research in the hydrologic sciences is devoted to understanding movement of water, and the movement of chemicals and sediment transported by water in watersheds. As a second example, evaporation rates may differ greatly among an agricultural field, a nearby woodland, and a nearby wetland. Thirdly, the discharge of groundwater to surface water may vary in different parts of watersheds because different rock and sediment types may be present. The hydrologic cycle is a basic concept that water managers need to keep in mind in their daily work. When the flow of water is manipulated to fulfill human needs, it is necessary to understand how these actions will affect the hydrologic cycle and, ultimately, the availability and quality of water to downstream users. Thorough understanding of the hydrologic cycle is absolutely necessary if maximum use of the water resources is to be achieved, while avoiding detrimental effects to wildlife and the environment as a whole. The hydrologic cycle is a very important and practical concept for maintaining a healthy and livable Earth. To a large extent, water shapes the Earth through erosion and deposition of sediments and minerals. Water also is fundamental to life on Earth, where water makes up a substantial part of living organisms, and those organisms need water for life. Therefore, managing water resources by thoroughly understanding the hydrologic cycle at scales ranging from the entire Earth to the smallest of watersheds is one of the greatest responsibilities of humans. SEE ALSO Drinking Water and Society ; Earth: The Water Planet ; Fresh Water, Physics and Chemistry of ; Glaciers and Ice Sheets ; Global Warming and the Hydrologic Cycle ; Groundwater ; Instream Water Issues ; Precipitation and Clouds, Formation of ; Precipitation, Global Distribution of ; Stream Hydrology ; Transboundary Water Treaties ; Wetlands . Crowder, J. N., and J. Cain. Water Matters, Vol. 3. Arlington, VA: National Science Teachers Association, 1999. National Geographic Society. "Water: The Power, Promise, and Turmoil of North America's Fresh Water" National Geographic Special Edition, 184, no. 5A (1993). Winter, Thomas C. et al. Ground Water and Surface Water—A Single Resource. U.S. Geological Survey Circular 1139 (1998). Follow a Drip through the Water Cycle. Water Sciences for Schools, U.S. Geological Survey. <http://ga.water.usgs.gov/edu/followdrip.html> . * See "Global Warming and Glaciers" for a photograph of a snowpack measurement. What is the percentage of water that is in motion (not locked up) in the water cycle? Is there available data on this? Thank you.